Leaping from tree to tree, as they float down the mighty rivers of British Columbia. The Giant Redwood. The Larch. The Fir! The mighty Scots Pine! The lofty flowering Cherry! The plucky little Apsen! The limping Roo tree of Nigeria. The towering Wattle of Aldershot! The Maidenhead Weeping Water Plant! The naughty Leicestershire Flashing Oak! The flatulent Elm of West Ruislip! The Quercus Maximus Bamber Gascoigni! The Epigillus! The Barter Hughius Greenus. With my best buddy by my side, we'd sing! Sing! Sing! I'm a.... CHOP!!! Oh no! Run away as it's a killer tree!!!! 1) What are your own origins, Ski? With great power and great strength, I originated from the United States of America, from a place known as Topeka, Kansas. I then got stronger as I moved to cities like Boston and the state of Maryland. Soon, I was too strong and too powerful! My mighty strength couldn't be controlled! So they moved me to a state that drained my powers, the state of California. Where here I remain, a normal person, like everyone else. Except for that Arnold Schwarzenegger person. As I'm sure he's like some kind of robot. There's no way he's normal. 2) What inspired you to create, ‘Legends of Log’? Besides being a weird kid growing up and playing a few rounds of D&D, I've also been a long time reader of Sword and Sorcery books and novels. Books like Fritz Leiber's, Fafhrd and Gray Mouser sagas. Michael Moorcock's, Swords Trilogy. Various Lin Carter and Andrew J Offutt anthologies like Flashing Swords and Swords Against Darkness. And of course, Robert E Howard's, Conan the Barbarian books and comics. All that, including watching a bunch of fantasy movies growing up, including those awesome monster movies from special effects wizard, Ray Harryhausen. And all those other great black and white B-monster movies from the 50s and 60s, including the Mighty Joe Young, King Kong and Godzilla. All these things I've mention and more, have had a great influence over me and has inspired me to create the Legends of Log. 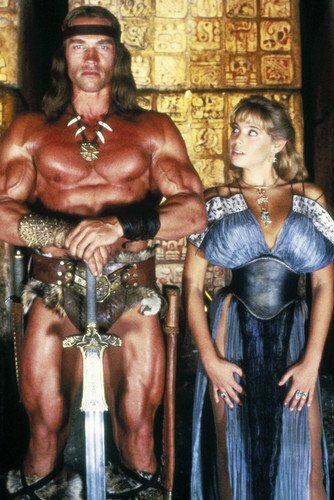 But most of all, the one thing that's really inspired me, is the mighty muscular Arnold Schwarzenegger as Conan the Barbarian! That's gotta be the one thing that really inspired me! Well? Maybe just a little. 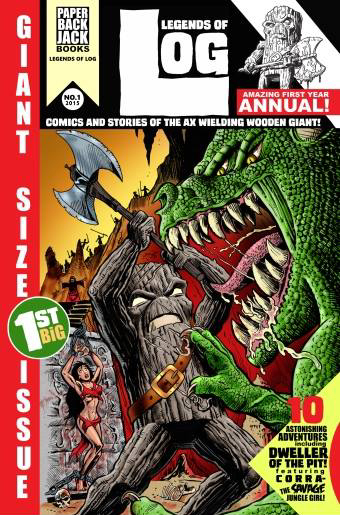 3) In your own words how would you describe this giant-sized comics annual? Oh! This thing is giant! 56 pages of action and adventure! All taking place during the dark age of sword and sorcery. 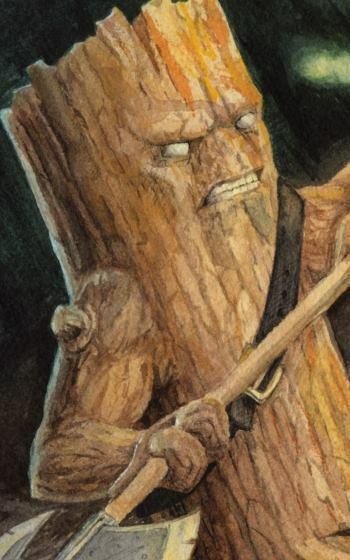 There's 10 different stories in this comic, and some really great illustrators worked really hard to bring these adventures of the mighty Log to life. And, yes, as oddly as it may seem, the comic is about a giant tree trunk. A giant tree trunk that happens to walk around, carrying a giant ax, and yells TIMBERRRRR! As he chops down man and beast that get him angry. Yes, my friends! He is the ax wielding wooden giant known as... Log! "ARURULGEH! GET YOUR COPY OF THE MIGHTY LOG! HE HAS MUSCLES JUST LIKE I DO! EEUAUAUGHHHUAUAAHH!" 6) What have you learnt about yourself through this endeavour? Creating the world and characters for the Legends of Log can be a fun experience. But writing the stories can be just a little tough at times, and sometimes things don't go as planned. I have a short attention span I think, and sometimes my mind likes to wander around and get lost, especially when I should be writing stories for the comic. But the good thing is, I always come back to the writing. So not all is lost I suppose. 7) During your time in this field, what is the one thing that has kept you in good stead? Seeing the amazing artwork that these illustrators create for the stories I write. I'm always in awe of knowing that the words they read on that script, are words that they can translate, into beautiful and amazing images for all the readers to enjoy. 8) If ‘Log’ had a motto, what would it be? "Defend the trees!" And so on that note, dear reader, I'd like to say TIMMBERRR to my mate Ski, whilst thanking him for telling us about his giant-sized comic, Legends of Log. Plus while I'm at it, I might as well inform you to check out his website, facebook, and twitter pages.